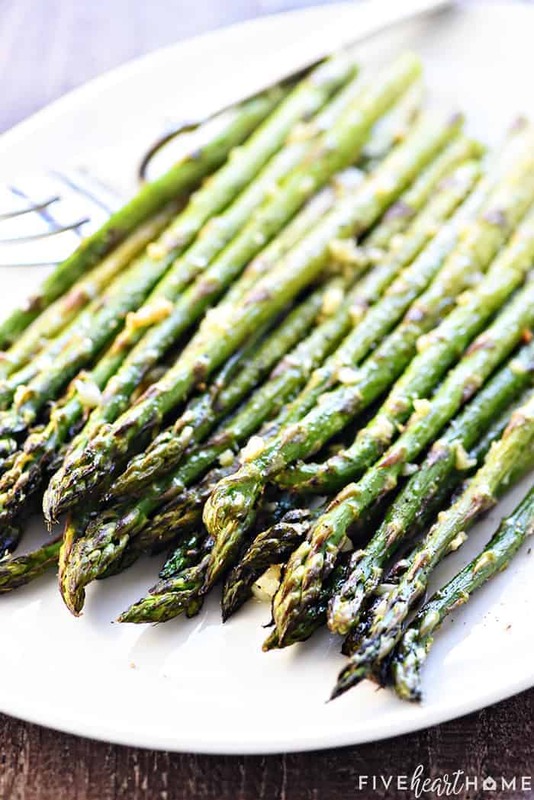 This Roasted Asparagus recipe is simply seasoned with olive oil, garlic, salt, and pepper for a delicious, easy, versatile, springtime side dish! 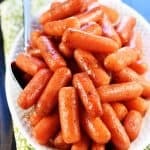 If you love simple, mouthwatering veggies, then you should definitely try these tender Roasted Rainbow Carrots with Thyme, this Roasted Broccoli with Parmesan, Panko, & Pecans, or these Baked Parmesan Zucchini Rounds. Roasting is, hands-down, my favorite way to cook vegetables. It brings out the flavor and chars and caramelizes the texture of veggies like no other cooking method. In fact, my family actually always fights over the darkest bits. So with spring upon us, I thought it would be the perfect time to share simple, classic Roasted Asparagus! 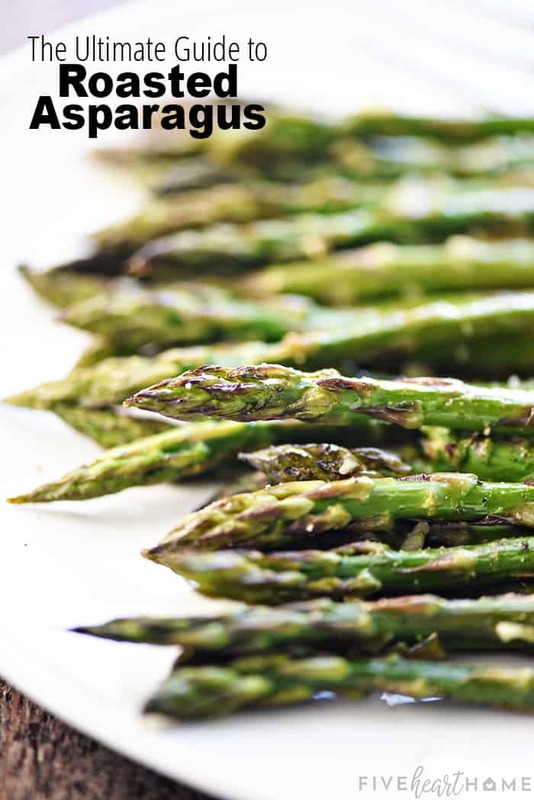 This asparagus recipe is easy to make but extremely tasty, simply seasoned with olive oil, garlic, salt and pepper. Roasted asparagus is actually nothing more than baked asparagus, cooked at a nice, high temperature for 10-ish minutes. 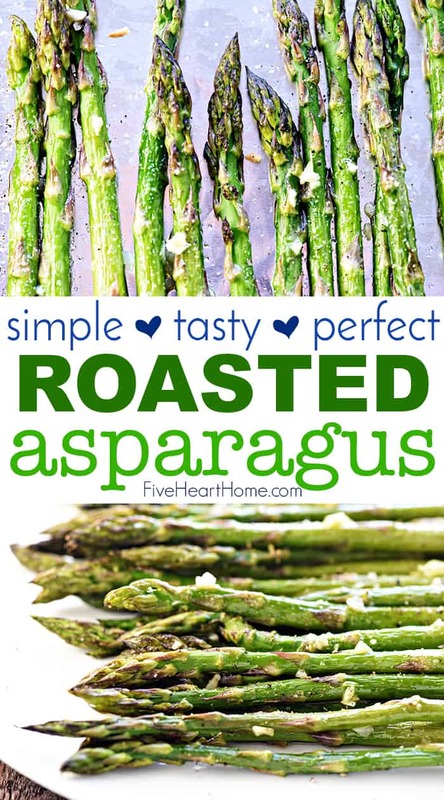 And since it asparagus is in season right now, that means it’s budget-friendly and easy to find. 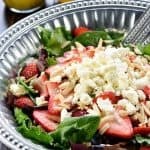 So go ahead and add it to your grocery list because you’re going to want to make this delicious side dish ASAP! Roasting asparagus requires very little effort. Seriously…it pretty much cooks itself. But you do have to get it on the pan, so the first thing you’ll want to do is to to wash your asparagus and pat it dry. Then you need to remove the bottom, tougher parts of the stalks before cooking. You can cut the ends off in one of two ways. You can take each stalk and grab each end (being careful not to hold the tip directly) and bend it. It will naturally break where the tough part begins. You can go ahead and do every spear this way until the tough ends are all removed. Once you have your stalks prepared, spread them in a single layer on a large, rimmed baking sheet. (You can do this with or without a foil liner.) From there, drizzle on the olive oil, and then the minced garlic, salt, and pepper. Roll them around with your hands or use tongs to make sure every spear is coated. Then pop the pan into a preheated oven and bake for 10 to 15 minutes, depending on the thickness of the spears. You’ll want your cooked asparagus to be slightly darkened and tender but not super soft and limp. This is a simple recipe which means there’s plenty of room for customization! Below are some of my favorite ways to take my veggies up a notch in flavor. That’s right, folks…these techniques will work with most any vegetables! The best part is, they require very minimal effort for an extra boost of deliciousness. Sprinkle with freshly grated Parmesan or Romano. Drizzle with lemon juice and/or sprinkle with lemon zest. Sprinkle with chopped, toasted nuts. Serve with a special topping like Parmesan Panko & Pecans. Asparagus is a very healthy veggie. Not only is it an excellent source of folate and fiber, but it’s also chock full of vitamins such as B, C, K, and E. It’s a low-calorie, low-fat, and low-sodium food as well. It also contains a trace mineral called chromium. 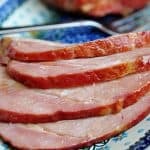 This mineral enhances your body’s ability to move glucose from your bloodstream into your cells, which is a good thing if you have to watch your blood sugar levels. 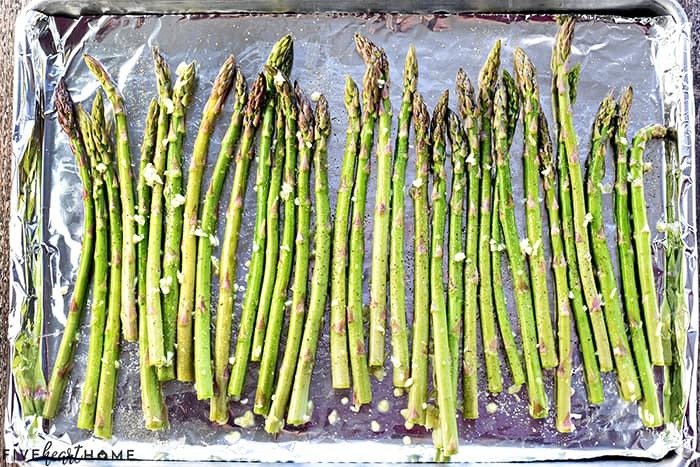 Cook your asparagus on a large rimmed half sheet pan. Lining it with foil will make clean-up easier. One of the most helpful tips I can give you is to time your roasted asparagus for right when you’re just about ready to eat it. It goes cold and, well, yucky (for lack of a better word), quickly. You’ll want to enjoy it when it’s nice and warm, right out of the oven. If you can’t time it exactly, keep it on the roasting pan and cover with a sheet of foil or transfer it to a serving dish and cover to lock some of that heat in. Don’t skip the washing, drying, and trimming of the asparagus. Trust me, you don’t want to try to bite into the tough end of an asparagus stem. 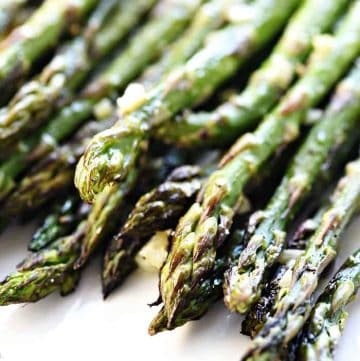 If you’re not quite ready to cook the asparagus, you can keep it in your fridge’s veggie drawer for a couple of days. If you plan on keeping it in the fridge longer, you can put the spears upright in a mason jar, making sure the not-yet-trimmed-ends are soaking in about an inch of water at the bottom. Cover loosely with a plastic bag until you’re ready to eat. Discard any spears that appear slimy, off-color, or are very limp. So what do you say? 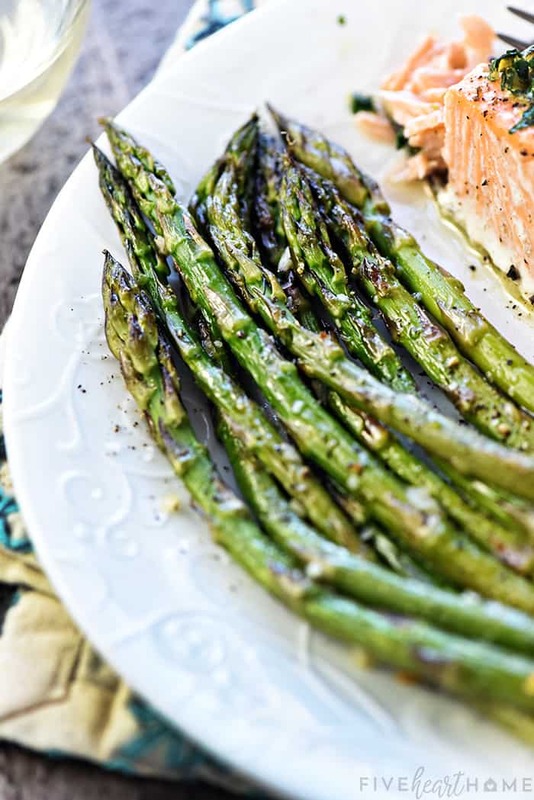 Are you ready to try this simple and delicious asparagus recipe and brighten up just about any meal? Whether you need an easy, last-minute Easter side dish or are looking to change up the same old, same old weeknight veggie, this Roasted Asparagus will have you covered! With the rack in the center position, preheat the oven to 400°F. Spread the prepped asparagus on a large, rimmed baking sheet. 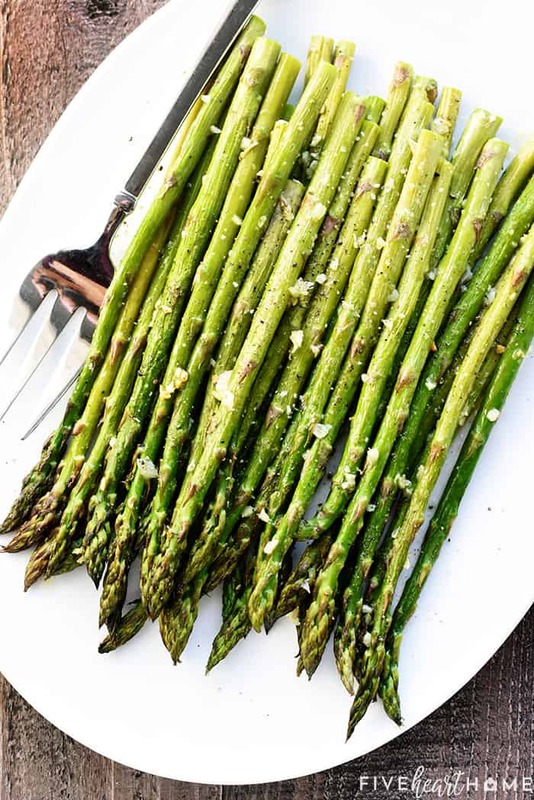 Drizzle the asparagus with olive oil, sprinkle with minced garlic, and season with salt and pepper, rolling the asparagus around the pan until evenly coated. 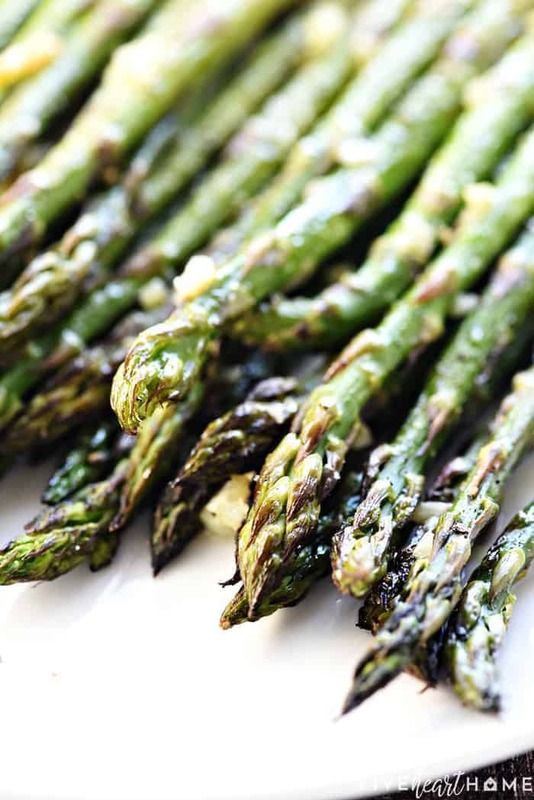 Place the pan in the oven and bake for 10 to 15 minutes or until the asparagus is tender with darkened tips, depending on the thickness of the spears. Check the seasoning and sprinkle with additional salt and pepper, if desired. Serve immediately. Thick spears of asparagus hold up best to roasting. Thin spears will cook much faster and may be done in less than 10 minutes, so check them early. To prep the asparagus, either slice or break off the tough ends of the stems. If desired, you may line your baking sheet with aluminum foil for easy clean-up. If you don't want to get your hands messy, place the asparagus in a large bowl or gallon-sized plastic baggie (I use a long, rectangular-shaped plastic container that fits the shape of the asparagus bunch). Add the oil and seasonings, seal the bag, shake or roll the asparagus around to evenly coat it. Then dump and spread, in a single layer, onto the pan.